Nothing brings out the Christmas spirit better than the smell of fresh pine needles from a real Christmas tree. For those of you who still prefer the real thing, but don’t know where to start, read on. This Christmas tree buying guide will supply you with all the information you need. You can place the tree right next to your telly to enjoy it while watching Christmas specials or a sitcom. Another good example: near a window. Make your neighbours and random strangers envious of your glorious tree. An even better idea: place your real Christmas tree in a well lit corner. Remember to never place your real tree near heat sources because its needles will fall off. High traffic areas near doorways are a no-no as well because somebody will surely knock the tree over unintentionally. We all live in different sized apartments and houses and in the end this will, inevitably, influence our choice. Some people prefer artificial trees because they can be taken apart and put in a box. The good news is real Christmas real trees can be trimmed. Still, be sure to measure your space accordingly for best results. Height, depth and width are all equally important. You might consider moving some of your furniture to arrange room for your Christmas tree. This graphic by BalladDesigns might be of help in measuring how much space you have and need for your real Christmas tree. A large percentage of people prefer to buy their Christmas trees in person. That’s no surprise because you actually have the chance to see the item before purchasing it. It’s also family fun to go around London with your kids and pick the best tree you can find. Then comes the aspect of transportation. Sometimes your car just isn’t large enough to fit the whole tree. Then you either pick a smaller tree or rent a van. You can also tie the tree on the top of your car, but be very careful when driving through tunnels. And the last option would be the London underground, but that would probably be a bad idea. Buying a Christmas tree online definitely has its advantages and it’s no wonder why many companies, including ours, offer christmas tree delivery services. For one, you don’t need to spend hours outside in the bone-chilling cold in search for that perfect tree. Second, you don’t have to compete with other Londoners who want the same tree. Third, delivery and installation is free, so you literally just need to stay home and wait. Search for a bright green coloured Christmas trees. This means they’ve been recently cut and are still healthy and fresh. The fresher the tree is the longer it will last. Check for brown needles. Every Christmas tree has some, but if you find more than just a few, don’t buy it! It’s already started to lose its foliage and won’t last until the end of December. Run your hand through the needles. Almost none should fall off. Another way to test is by giving the tree a strong shake, if the sales person allows you. If you see a lot of needles falling off, go for a different tree. This one is likely very weak and not taken care of properly. Check if the base of the trunk is straight. The maximum width of the base should be around 20 cm. Inspect for insects. DON’T PANIC! The small creatures don’t live on the tree, they just hide in the foliage to escape from the cold. In fact they are in hibernation and will fall off once you give the Christmas tree a good shake. If you want to know more on the topic, go to our article on the matter here. With a little bit of research, real or fake Christmas trees is less of a Sophie’s choice, and more of a straightforward answer. Real Christmas trees are better for the environment and have that special look, feel and smell that our subconsciousness associates with the spirit of the winter holiday. In our dedicated gardening blog, we go at lengths to compare the pros and cons of real and artificial Christmas trees, so check it out at your convenience. Christmas trees vary in prices depending on where you buy them and their type. You will find many types such as Canaan Fir, Noble Fir, Grand Fir, Douglas Fir, Concolor Fir, but the most popular choice for Londoners has always been the Nordmann fir (Abies nordmanniana). This tree has a lovely symmetrical shape and it’s needles are not sharp making it suitable for families with pets. The Nordmann Fir needles also don’t tend to drop when the tree dries out. Final benefit: the wood is often used in paper making, so you know, the tree continues to serve nature after you dispose of it. So, how much should you spend on Nordmann Fir christmas tree? 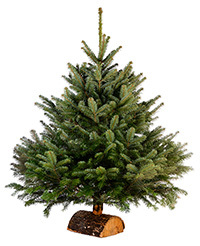 The smallest size Nordmann fir (4-5 ft) can cost anywhere between £35 and £40. Naturally as you go up, so do the prices. 6 ft christmas trees are sold for about £45, 7 ft trees for £55, and 8 ft christmas trees can reach £69. Mind you, those prices are only for the trees and do not include a stand. You can always buy a water stand separately, provided you don’t mind the hassle. Or you can simply order one along with your tree. Buying a 4 ft Christmas tree with a stand cost around £69, while a 6ft tree plus stand goes for £75. 7ft Nordmann Firs with stands cost £85 and 8ft tree are priced £99. Disposal of the christmas tree once the festivities are over is another matter to take into consideration. The easiest way is to leave your Nordmann Fir outside and wait until the council guys come to take it. Or book a disposal service with the site you’re bought it from. Fortunately in this case, the fee is flat and it doesn’t matter how tall your tree is. Christmas tree disposal costs around £49 depending on your seller. When Is It Ok to Put Up Christmas Tree? There really isn’t an exact answer to this question in any Christmas tree buying guide. Back in the old days people would put up their trees on the second weekend of December. According to Roman Catholic traditions you aren’t supposed to put the tree up until until the afternoon of Christmas Eve. However that’s a bit too late in the modern age where we’re used to having everything as quickly as possible. Perhaps the beginning of December is the perfect time for two reasons. If you set up your Christmas tree too early, it will look worn down until Christmas. If you set it up too late you will hardly enjoy it long enough. A healthy Nordmann fir can survive up to 6 weeks if watered regularly. Make a fresh cut off the bottom of the trunk – Chances are the base has already healed from when the tree was cut from the ground. By cutting off a small portion of about half an inch (about 1.27 centimetres) you uncover fresh wood which will absorb water more readily. Water it regularly – the tree stand must have has a built-in compartment for water where the liquid stays and gets slowly get absorbed by the tree. All you need to do is make sure it’s full at all times. Freshly cut christmas trees are very thirsty and drink about a gallon of water a day. Fertilisers of any kind are not required. There are myths on the internet, about putting sugar in the water, but we don’t recommend that. Don’t make the room temperature too high – Christmas trees naturally love the cold. If you place them near a fireplace or an air conditioner, they will lose their needles in no time regardless of how much you water them. If you’re not planning to put the tree up right after purchase, be sure to store it in a cold place such as a garage. Leave it to your council – The easiest way to dispose of your Nordman fir is to leave it with your garden waste. However be aware that this can take some time as council waste collections are often late and miss the desired dates. And you can always get advantage of our very own Christmas tree disposal service in cases such as these. Leave it for charity – there are organisation which will gladly take your unwanted Christmas tree. Some of them might even pay you a small fee. Fortunately in the UK, and especially London, we have numerous christmas tree collecting organisations. If neither one comes to mind, just head over to charityxmastreecollection.com to register your tree for charity. Replant it – Mind you, only Christmas trees with a root system can be replanted. This method will likely not work with a trees whose roots have been cut off as they can no longer attach themselves to the soil. If you are keen on purchasing a live Christmas tree for the purpose of replanting it later, check this material by Mother Earth News. Give it to a garden centre – Another option to consider is dropping the tree at a local garden centre if you have one nearby. There it will be chopped up and used as chippings throughout the year. Run a vacuum cleaner in your living room after the tree is gone to make sure you’ve cleaned any fallen needles. There will be at least some for sure. So there you have it, your very own Christmas tree buying guide. From tips on how to position your tree, to caring for and disposal after the holidays, you get the full picture to make an informed choice about the centrepiece of your holiday decoration. Provided you apply the care measures a real Christmas tree needs, you’ll be able to enjoy its spirit throughout the festivities! Did we miss anything? Do you have any additional tips on how to buy a real Christmas tree? Share them below in the comments or give us a shout in social media!